Sadly I have no photos from the weekend. So this weekend was cozy and rainy and totally mellow (one of our first truly mellow weekends in a couple of months.) We hunkered down and played games, watched The Beatles Anthology with Audrey, drew and cooked + hosted a dinner Saturday evening for our couples book club. I also spent the better part of Sunday going through my "inspiration folders", and I came across this story I'd ripped out from the June Dwell. "Francis is thin and austere, the saint of restraint and simplicity,: he is the environmentalists’ folk hero, “doing more with less”… Paschal, a chubby, spoon-wielding cook, is the patron saint of hospitality and abundance." I loved this, as it's pretty much the goal for how I live...this idea of simplicity and restraint balanced with open arms and abundance. The luxuries that seem most appealing to me (despite the nubuck messenger bags and big chunky rings I often dream of) are stacks of fresh white towels, full bookshelves, a farmer's market haul waiting to be made into a big, cozy meal for a load of friends... not running out of red wine. Those two Saints would do well in anybodys home - we need all the help we can get. Wow, this feels like the most perfect message for Monday morning. 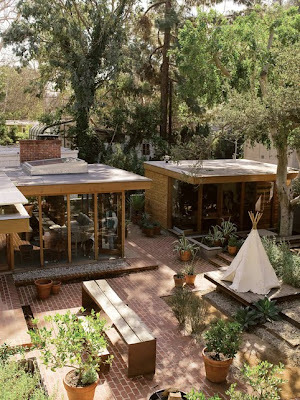 Love the photos of this dreamy house and the idea of simplicity with abundance - they can coexist! P.S. Congratulation on opening your store. Looks like a fun new online venture. Francis is my man, but Paschal is all new to me. I love this balance. I tend to swing to extremes and it never feels right. love this. 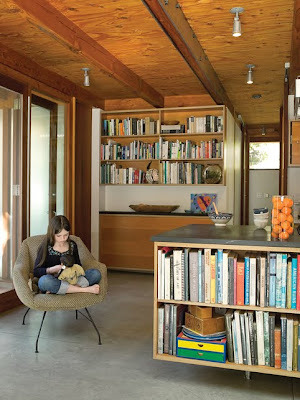 ooo, i loved that article in dwell. i think that house is my dream house, and the beautiful way they spoke about their home made it all the more beautiful. and i'm dying for some statues like those of francis and pascal. so glad you posted this. I love this! You've put into (very eloquent) words, my thoughts exactly! YAY! Your shop is open....it is beautiful hun and congratulations! And I love this post and all that they and you have to say about their homes. I think I strive for that too.....thanks for reminding me! love love love the house! windows! 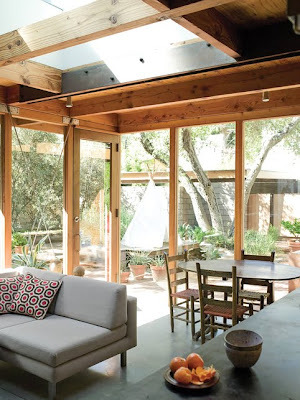 skylights! light! And how exciting that you've opened a shop. It's so cute, joslyn! You must be an incredibly busy woman! I love this - the house and the notion of the competing saints! How divine! I love the theme and the inspiration of such a spot! Oh. 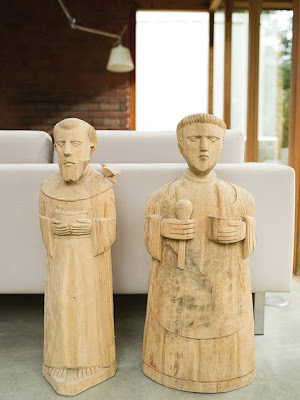 I want them, too, Francis and Paschal. How perfect... Thanks for sharing. I saved this article too! I also loved the idea of having patron saints for your house-- to infuse your space with intentions. Great post! I was raised Catholic, so I've already been well acquainted with St. Francis, patron saint of animals and the environment (he's one of my favorites). I love the idea of saints blessing the home space.